Lambert Says Sports: Flip the Switch on "Flop"
Flip the Switch on "Flop"
I have nothing personal against Flip Saunders. 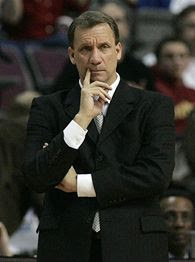 History shows us that Flip Saunders should be better known as "Flop Saunders". He can't win! He really can't. He has taken a Detroit Piston Team who outside the San Antonio Spurs has dominated consistently and done absolutely nothing with them. A team that has 4 perennial all stars he cant coach over the top. Think Back to game 5 against the "Lebron James Cavaliers" When Lebron was on his Run of 29 in a row. "Flop" threw out a box and 1 defense. You know who plays Box and 1 and "gimmick Defense" Junior High Coaches. When an early developing, pimpled face young man is faster and stronger then anyone on his team. In Minnesota, Flip went from the seasons of 96- 03 exiting the first round of the playoffs. 4 times he had 50 win seasons in 9 seasons. 03-04 He led the 58 Win Timberwolves regarded as a favorite in the west. Lost 4-1 to the Lakers with home court advantage. The Pistons with the NBA's best record in 2006, had four All-Stars in their starting lineup, Rip, Taysuan Prince, Chuancy Billips and Rasheed Wallace. The 64 Win Pistons were heavy favorite going into the playoffs to capture the NBA Championship. However, they lost in the Eastern Conference Finals to the Miami Heat. 4-2. In 06-07 Once again the Pistons had the best record in the Eastern Conference, but lost in the Eastern Conference Finals 4-2 To The "Lebron James Cavaliers"
Do you think Larry Legend would bring the Bulls to the promised land or even the finals is he came to Chicago? Either Larry Legend or bringing back Phil Jackson. They need to draft Beasley! larry in chicago? maybe phil. they need scottie to coach. he's to busy on south beach perculating.